Download the Labor Market Profile Here. 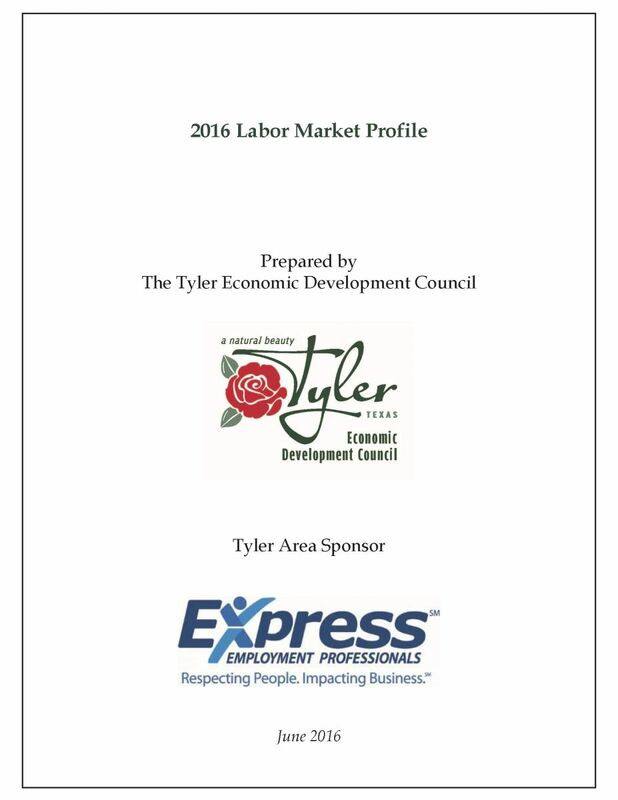 The Tyler Labor Market Profile is a detailed assessment of the Tyler area labor force within a 30-mile radius. The publication is produced every 3 years by the Tyler Economic Development Council. The latest profile was completed in 2016 and is the tenth edition. You can download our latest labor market profile by clicking on the image to the left. The UT Tyler Hibbs Institute for Business and Economic Research has also published a Labor Market Profile for East Texas in their December 2018 Newsletter. The research for the Tyler Labor Market Profile was conducted during May 2016 - June 2016 by The Tyler Economic Development Council and is based upon information from U. S. Census 2010 estimates, Census On The Map Program, American Community Survey, Texas Workforce Commission, and other data sources. The purpose of the survey was to provide labor market information to businesses considering expanding or opening new facilities within the Tyler area. Detailed information concerning the labor market should be helpful in making these decisions. Numerous aspects of the labor market, such as current status, availability, minimum wage requirements, and demographic characteristics, were examined. This information should enable employers to make more informed and rational decisions regarding expansions and investments in the Tyler and East Texas area. The nine-county labor shed contains 324,434 full time and part time workers. The two largest contributors to the regions civilian labor force are Smith County with 101,876 workers and Gregg County with 62,194. The 2015 Smith County unemployment rate of 4.5% is below national rate and is the regions second lowest rate after Anderson County (4.2%). The Labor Force participation rate for Smith County is 62%. Of the 46,851 non-Smith County residents working in Smith County, approximately 41.7% commute from the eight neighboring counties that make up the Labor Shed. Driving Distance- 42% of Smith County workers drive less than 10 miles for work, 19% commute 10 to 24 miles, 13% commute 25 to 50 miles, and 26% commute over 50 miles. Travel Time- Smith County workers travel an average of 22.4 minutes one way to work. The number of workers that do not live in Smith County has increased steadily at a rate of 5.1%, while the amount of Smith County residents leaving the County for work has increased at a rate of 4.1%. Despite this, the share of jobs held by Smith County residents has remained steady over the past 6 years. The majority of the 46,851 individuals who commute into Smith County for work are between age 30 and 54 (52.6%), earn more than $3,333 per month (35.3%), and work in the Service Industry (58.5%). Of the 32,173 Smith County residents who leave the county for work, 53% are between age 30 and 54, 34.5% earn more than $3,333 per month, and 49.6% work in the Service Industry. The age distribution for Smith County indicates that 53.1% of its workers are between age 30 and 54, 24.9% are age 29 or younger, and 22% are age 55 or older. Similarly, the Labor Shed has 53.5%, 23.6%, and 22.8% in the respective age groups. Smith County has 36.8% of its workers earning between $1,251 and $3,333 per month, 35.9% earning more than $3,333 per month, and 27.3% earning $1,250 per month or less. The Labor Shed closely mimics this with 37.8%, 36.3%, and 25.9% in the respective categories. Approximately 25.5% of Smith County workers have attended college or have an Associates degree, and 16.9% have received a Bachelor’s degree or advanced degree. The Labor Shed follows this distribution, with .1% higher employees who have attended college, and .9% fewer employees having a Bachelor’s degree or higher. The racial background of the Smith County workers consists of 78.7% White, 17.8% Black, 0.7% American Indian of Alaska Native, 1.8% Asian, 0.1% Native Hawaiian or Other Pacific Islander, and 1% of two or more race groups. The Labor Shed has 80.4% White, 16.3% Black, and 1.6% Asian, the remaining categories do not change. As defined by the U.S. Census Bureau- 13.3% of the Smith County workers are Hispanic or Latino, and 13.1% of the Labor Shed workers are Hispanic or Latino. The Smith County workforce is composed of 47.1% Males and 52.9% Females, while the Labor Shed has 49.4% Males and 50.6% Females in the workforce.